Anyone needing evidence that punk rock is just as much an American musical institution at this point as jazz or country, look no further than three-chord stalwarts Bad Religion. Often referred to as godfathers of punk, the sobriquet becomes more applicable with each passing year; perhaps the term will switch to “grandfathers of punk,” soon. But the band has slowly become one of the longest-running groups in punk history through a workmanlike dedication to touring and recording, resulting in a catalog of music now 16 albums deep and counting, not to mention numerous singles, live releases, and even a record of Christmas carols. The primary trait of Bad Religion’s music is its consistency—for naysayers, perhaps a little too consistent. Critics might charge that this trait renders a “where to start” guide somewhat moot, as the music the group is making in 2015 doesn’t sound all that different from the music it made in 2005, or 1995. But that’s an overblown claim: There are notable differences, and the band has slowly evolved and grown over the course of its 35 years. Nonetheless, there’s an element of truth to the charge, given that the musicality of the songs remains very much the same, even as tempos, instruments, and band members vary. Fans (and the band itself) will happily cop to the fact that it’s not the most musically experimental group on Earth: Bad Religion may indeed only have about eight or nine songs in total—but those are eight or nine damn good songs. The group formed in 1979-80, with founding and still current members Greg Graffin, Brett Gurewitz, and Jay Bentley. Graffin and Gurewitz, the two primary songwriters, formed a musical partnership that resulted in the blossoming of a new, more melodic sound for California punk, which had—until Bad Religion came along—been much more a receptacle of the shout-first-worry-about-notes-later variety. The band created a form of literate, musical punk that maintained the anger and intensity of its forebears, but harnessed it to Beach Boys harmonies and intellectually challenging lyrics. It may sound old hat now, but in the early ’80s, there was no one else quite like Bad Religion. Bad Religion’s brand of thesaurus rock always seemed a bit too cerebral for the pop charts, even as the group’s hooky, melodic punk became more and more the sound of mainstream commercial radio. Yet by the time of its first major-label recording Stranger Than Fiction, the band was able to land a major radio hit with “21st Century (Digital Boy),” which reached no. 11 on the Billboard Modern Rock Chart. The song had actually been around for years, originally appearing on 1990’s Against The Grain. The re-recording was both in deference to Atlantic Records’ request for “a hit” and to Gurewitz’s desire to re-do it (though Gurewitz has publicly contradicted this, saying he prefers the original version). Nonetheless, there’s a reason it’s a signature tune for the group: It’s arguably their catchiest song, with lyrics that touch on many of the central themes of Bad Religion’s output: societal conformity and resistance, couched in the ironic tone of someone who has already given in. Shot by future blockbuster director Gore Verbinski, the video actually functions as an effective introduction to the band: erupting out of the static of a television set. With such longevity, the band’s history can be broken up into three distinct periods, each one leading the group into a new phase, and a reinvention of their sound. The band’s first six records were all released on Gurewitz’s Epitaph, the label that—for a brief period in the mid-’90s—essentially embodied American punk rock’s ascendance to the mainstream for a large percentage of the population. (Within the span of a year, the label released multiplatinum album Smash by The Offspring, Rancid’s …And Out Come The Wolves, and NOFX’s Punk In Drublic.) With Suffer, No Control, and Against The Grain, the band established itself as the reigning champion of West Coast punk rock, influencing countless other groups. Many, like NOFX’s Fat Mike and Rage Against The Machine’s Zach De La Rocha, credit the band with helping shape the sound of contemporary punk. No Control, the first Epitaph record to sell more than 50,000 copies, takes the melodic potential developed on Suffer and refines it into the sound of a band firing on all cylinders. Graffin and Gurewitz are working in tandem, rotating back and forth between each other’s songs, and at that early stage it was often difficult to tell who wrote what. A high point is “I Want To Conquer The World,” which embodies the strongest elements of the songwriting: a sing-along refrain both anthemic and raw, with wittily sharp lyrics. It’s a rousing call to action that doubles as a critique of rousing calls to action. Like many groups, Bad Religion’s experience on a major label started out promising, then gradually dissipated, leaving behind records among both the best and worst of its career. Recipe For Hate (originally recorded for Epitaph, but quickly re-released after the band signed to Atlantic), Stranger Than Fiction, and The Gray Race all represented commercial and musical advancements for the group, the sounds of Bad Religion growing into itself as a mainstream, accessible act—something it took awhile for the members to be comfortable with. There are spotty moments on each record, but they also contain some of the strongest songs of any period. “American Jesus,” off of Recipe For Hate, deserves to enter the pantheon of punk-rock legend: a killer guitar line fused to brilliantly corrosive lyrics, and another great sing-along refrain. Listening to it today, it’s the rare punk rock song that has lost none of its sense of vitality or immediacy. The shouted “one nation, under God” coda still elicits chills. One of the most significant moments in the band’s history can be traced to an initially disastrous event. During touring for The New America, drummer Bobby Schayer began having serious problems with his shoulder due to a damaged rotator cuff. The chronic progressive injury eventually hit the point where he could barely lift his arm, and he was forced to quit the group. The drums were taken over by Brooks Wackerman, an incredibly versatile and lightning-speed drummer who instantly raised Bad Religion’s energy and re-invigorated the band. Simultaneously, the group had ended its contract with Atlantic, and returned to Epitaph. More importantly, Gurewitz, who had left the band acrimoniously during the release of Stranger Than Fiction, returned to the fold, a more mature and heartfelt songwriter than before. It’s hard to overstate the effect of Gurewitz’s return on Bad Religion’s output. The band’s first new album featuring Wackerman and Gurewitz, 2001’s The Process Of Belief, isn’t a return to form: It’s the forging of a new form. Whereas previous efforts had struggled to smoothly incorporate other musical elements like folk and country into the group’s four-on-the-floor punk, Graffin and Gurewitz found themselves seamlessly integrating time signature changes, more ambitious song structures, and a newly resonant level to their lyricism. Gurewitz has often cited Elton John’s lyricist Bernie Taupin as a role model, and his songs reflect that, with an increased attention to emotional relationships and personal yearning. Its subsequent albums have maintained a remarkable consistency, arguably the most dependable string of albums in the band’s career. But special attention should be paid to 2004’s The Empire Strikes First. Like many punk groups, Bad Religion found itself both outraged and artistically energized by the gross malfeasance of Bush-era America. Much as the reunited Graffin and Gurewitz fostered a healthy competition between each other to improve their songwriting chops, so too did the toxic jingoism and reactionary American culture of the time galvanize the band to new heights. The result was a heady stew of political agit-prop contained within some of the most outsized and anthemic songs of Bad Religion’s existence. Arena rock for the politically minded, it reaches its apogee with “Los Angeles Is Burning,” a slice of hummable, Beach Boys-laden nihilism that’s easily one of the best songs the group has ever written. By the time of 1992’s Generator, both Graffin and Gurewitz were straining against the confines of the standard Bad Religion formula of hard-charging, 4/4 verse-chorus-verse with three chords and no variations. This led to experimentation that found the band playing around with different rhythms and instruments, and specifically introducing a faint hint of prog rock into their sound. It resulted in some weak spots—Recipe For Hate’s “All Good Soldiers” was probably better in concept than execution—but also provided unexpected sources of inspiration, as in Generator’s “Only Entertainment,” “Atomic Garden,” and the title tune, which dares to alter the band’s formula to such a degree that the song actually stops in its tracks. All of the subsequent efforts, however, stemmed from the combination of elements that first came into sharp focus on 1988’s Suffer. After a disastrous (band cohesion-wise, anyway) foray into synthesizer-driven music on Bad Religion’s second full-length album Into The Unknown, the group had splintered, joining other projects or quitting music altogether. It was Circle Jerks guitarist Greg Hetson who convinced Graffin to re-start Bad Religion. After an EP that re-introduced the band’s signature sound (appropriately titled Back To The Known), Gurewitz rejoined and Suffer became the first album released on Epitaph Records. While the band had yet to develop the Brian Wilson-esque harmonies that would become such an integral part of the sound, this was the first effort to see Graffin incorporating the more traditional rock elements into what had previously been a much more traditional, hard-edged California punk rock sound. That being said, pleasures can still be found amid the vague statements of anti-popular culture, some of which are as dark as anything the band has done. “The Biggest Killer In American History” and “Victims Of The Revolution” both ring with menacing anger, and “Sowing The Seeds Of Utopia” wouldn’t sound out of place on a record from the band’s initial stint on Epitaph. But it’s worth seeking out “The Voracious March Of Godliness,” if only to hear Graffin’s literate ruminations on the history of violent religious conflict fused to a track of pure ’70s rock. It’s not only Bad Religion that slowly incorporated folk and country into their repertoire—the reverse was true as well. The 2010 compilation Germs Of Perfection: A Tribute To Bad Religion features artists like Tegan And Sara, Ted Leo, Riverboat Gamblers, and William Elliot Whitmore performing often starkly stripped-down version of Bad Religion tracks. Perhaps the compilation pushed the band to dip their toes in the waters of less overdriven guitar sounds, because the closing track on that same year’s The Dissent Of Man is a sincere effort at a folk tune. 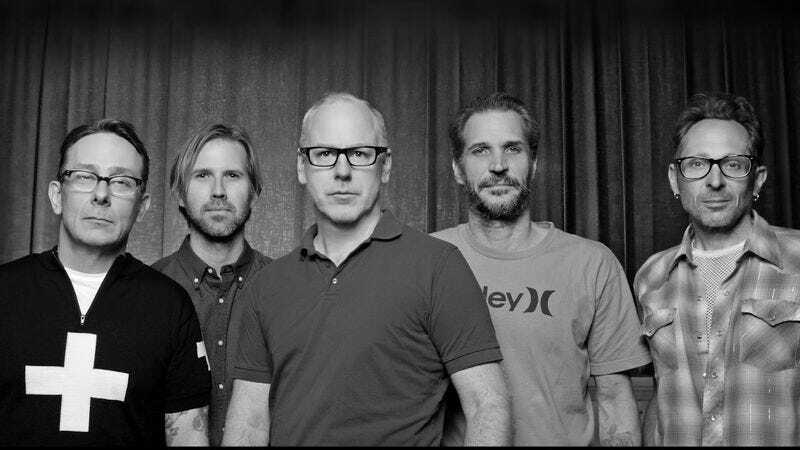 “I Won’t Say Anything” still feels like Bad Religion—Graffin’s voice is too distinct for that not to be the case—but it’s a lighter, gentler song, trafficking in upbeat harmonies and Gurewitz’s simple storytelling. The band’s second album was almost its undoing. After its debut record How Could Hell Be Any Worse? gained the group a solid following, Bad Religion took a bizarre turn. Gurewitz had purchased a Roland Juno-6 synthesizer for Graffin to compose songs on; instead Graffin starting writing entire compositions based around the synth sound. Into The Unknown sounds like nothing else in the band’s catalog, more a ’70s prog album than a slice of SoCal punk. It was disowned by everyone in the band but Graffin for the majority of the group’s history, and only recently started getting acknowledged for being a solid record in and of itself. (Robert Christgau, reviewing it at the time, compared it favorably to “late Hawkwind.”) A must-hear for completists, the album centerpiece is a seven-minute, four-part track by Graffin called “Time And Disregard.” It’s an aspect of the band that only rarely manifests on subsequent records, but is almost always welcome. While Bad Religion never became a multiplatinum success story, the band has achieved a much more robust and noteworthy type of success: It’s a punk-rock band that helped define an entire sound, and is still going 35 years later. That kind of longevity is rare enough for any type of artist, and practically unheard of in punk. That the group is also still putting out records as vital as anything it’s done is another impressive benchmark. 2007’s New Maps Of Hell and 2013’s True North once again elegantly fused the various elements of the group’s influences in an excellent combination of anger and appeal. The mature vibe of the band’s latter-day incarnation can even allow for something as silly as last year’s Christmas Songs, a collection of punked-up carols that may not be that different musically from the group’s usual output, but comes across like the guys were bored one afternoon and thought it’d be funny to churn out some high-speed fluff. There’s a new album scheduled for this year, and given the group’s track record, there’s no reason to suspect it’ll be anything other than another solid Bad Religion album. They don’t need to break the mold when they’re so busy perfecting it instead.